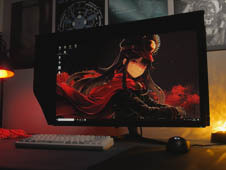 Like already mentioned in the Eizo Foris FS2735 review, I wanted to give the Viewsonic XG2703-GS a chance because Eizos Backlight Strobing feature was not what I had hoped for. 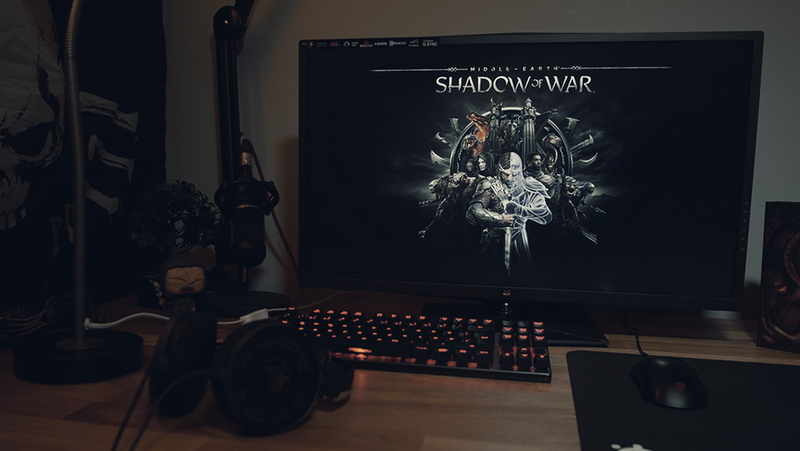 NVidias Backlight Strobing (ULMB) otherwise works as fine as expected. It was definitely better and works with fewer problems with (inverse) ghosting and crosstalk (take a look at the Ufo-Test pictures). 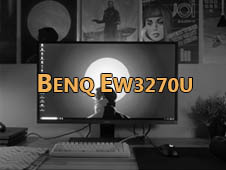 Compared to the Eizo Foris FS2735, the image becomes darker when you enable ULMB and colors look a bit more washed out. Moreover, ULMB creates gleaming artifacts within the area where ghosting occurs within the Ufo-Test. So, I still prefer ULMB but there is one thing where the Viewsonic disappoints me, the OSD menu. 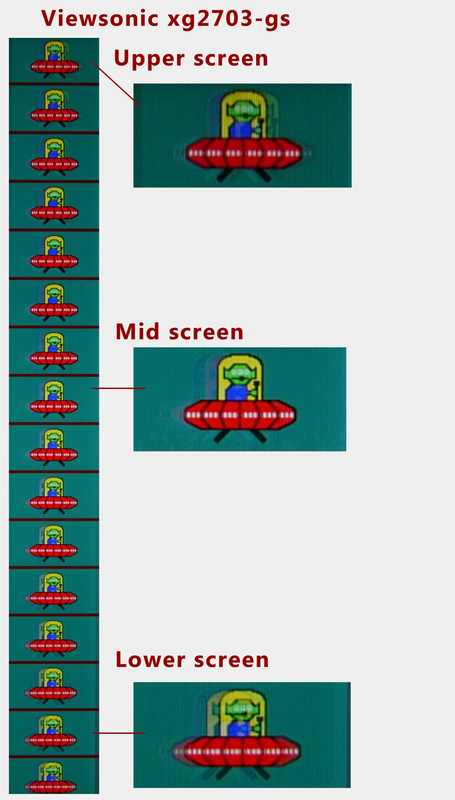 First, navigation is probably the worst I had currently within a gaming monitor. To be fair, you're not the whole day in the OSD menu. Second, you cannot set your own profiles. If you switch between two profiles, you have to set your brightness, contrast, and some other options, again and again. 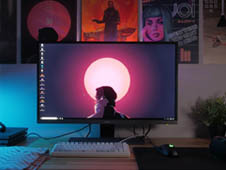 If you calibrate your monitor and set the color temperature you like, this specific color temperature setting is set to all other profiles. So in the end, it's not possible to create an own profile. 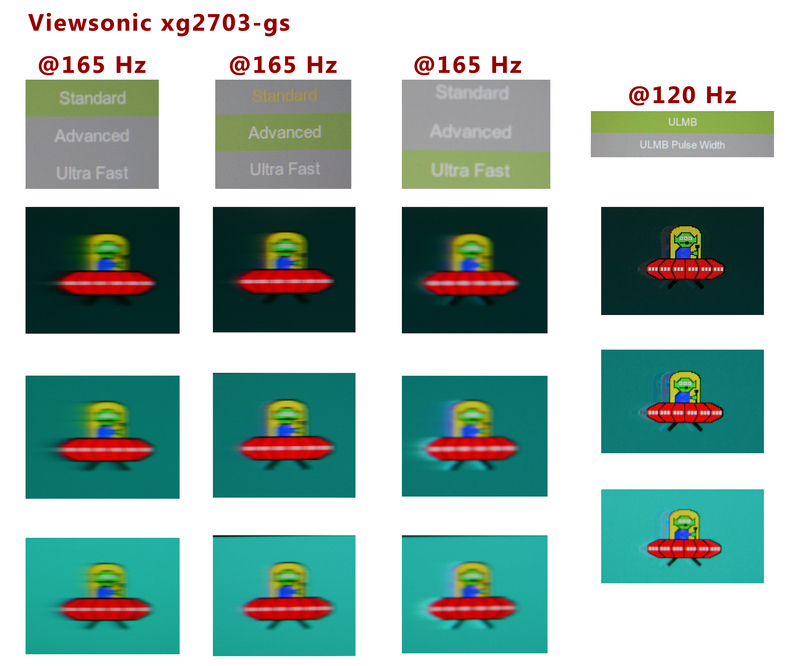 If you just need one profile or you don't feel disturbed with this "Viewsonic Feature", you definitely should take a closer look into the XG2703-GS. 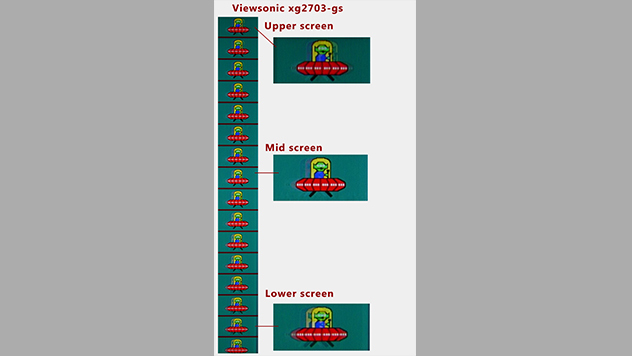 Updates and new information around the Viewsonic XG2703-GS can be found at the bottom of the article or in the table of contents (if available). Also available within the forum (click here). I've purchased a Viewsonic XG2703 for myself at Amazon's Cyber Monday for 599€ (which is a good but in my opinion still not a perfect deal when compared to Full HD 144 Hz 1080p TN models which are excellent for their price tags). 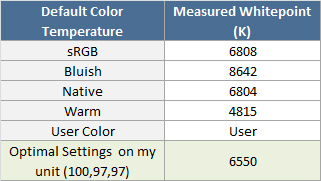 Contrast is almost the same - the native color temperature is measured at 6700K which is not bad. In my case, I lose a bit of contrast while I've set the monitor to 5600K. 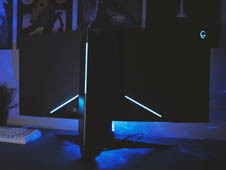 But the most important question, how about the IPS Glow? Well, this unit is also pretty same as my first exemplary but with two backlight bleed spots (visible at 120 cd/m2) because of the panel frame pressures against its panel. 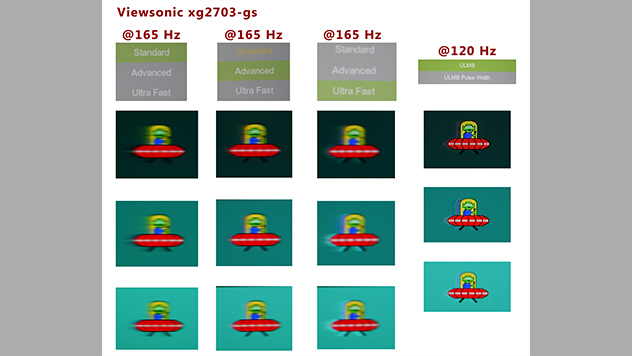 Watch the IPS-Glow / Backlight uniformity Video here. On brightness 100% we clearly can see that the panel frame construction on the Viewsonic XG2703-GS really is not well thought out so that I can see more backlight bleed issues than on 120 cd/m2. 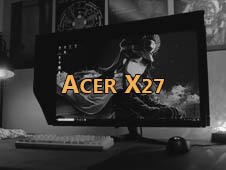 The Acer XF270HUA, for example, is better in this case (of course it can vary in each individual unit, but the risk should be less on the Acer). Glow in dark games is still present on the Viewsonic - I do not recommend to use this monitor with high brightness settings if you do not find a "golden" sample with less glow and blb issues. This is (again), why a panel frame construction is so important (especially on IPS panels) so that manufacturers should concentrate on this particular "topic". I have now my third unit because I was not satisfied with the blb and glow issues on the second unit. Unfortunately, the third unit at this moment is the worst. 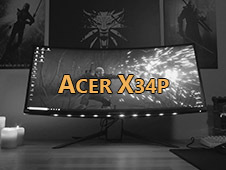 Moreover, I found out that color banding is a bigger issue on this unit compared to the Asus, Acer and AOC IPS WQHD models. On gamma 2.2, 120-50 cd/m2 and without using the black equalizer everything seems good (but still a bit more visible than at the competition). If you want a bit more details in blacks while setting gamma to 2.0 or using the black equalizer, color banding is directly clearly more visible. The sad thing is that the spots, where the panel frame pressures against the panel, is to 95% on the same places as my 2nd unit, just with more pressure which occurs in more IPS Glow and blb issues. - 165 Hz really isn't an "upgrade"
I bought my 2nd/3rd unit on Black-Friday for 599 Euros. 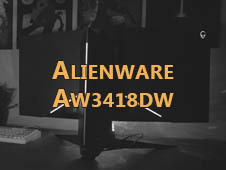 Still, with these existing issues and the black uniformity (as same as on the Asus, Acer and AOC model) I find the price too high when compared with a Full HD 144 Hz monitor with much better black uniformity abilities. 800€ is way too much in my personal opinion. has returned the monitor or has it left? 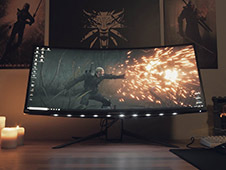 Believe your displaycal. So Gamma 2.4 in the OSD is Gamma 2.2 but if you prefer Gamma 2.2 in the OSD (Gamma 2.0), then why not? I mean, in the end it is personal preference and there is not really an "optimum" for games. But as I understand it, you then calibrate your monitor with diplaycal to gamma 2.2 (from gamma 2.0). Isn't it better to immediately put in monitor 2.2? Native OSD settings no better than calibration from 2.0 to 2.2? Yes. 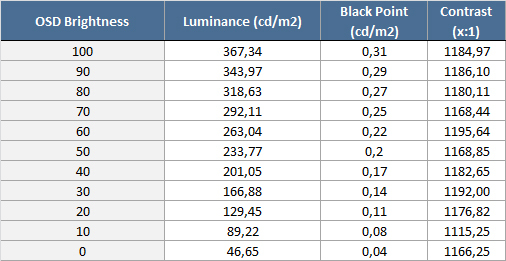 I do not really know why I have put the Gamma 2.2 except the Gamma 2.4 from the OSD as the optimum setting for gamma. 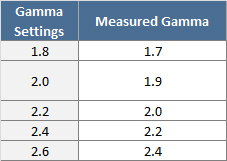 So Setting Gamma 2.4 in the OSD is better if Gamma 2.2 is preferred.